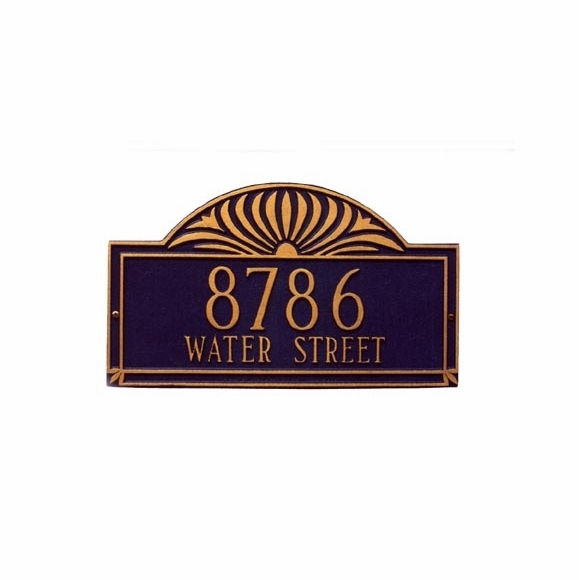 Whitehall 2002 Sunburst Address Sign Wall Plaque - - Estate size Sunburst address marker has two lines of text and measures 23.5" x 13.5". Line 1 holds up to five (5) 4.5" characters. Line 2 holds up to seventeen (17) 2" characters. Choose wall mount style (16042F; order above) or lawn style (shown in Related Products area at right). A smaller Sunburst personalized plaque, with 2 lines of text and measuring 16.25" x 9.5", is also shown in Related Products at right. 5-year mfg warranty. Made for you in the USA. Delivery time: please allow 2 to 3 weeks for delivery.